By: Emil G. Hirsch, M. Seligsohn, Wilhelm Bacher, Executive Committee of the Editorial Board. His Feats as a Hunter. Son of Cush and grandson of Ham; his name has become proverbial as that of a mighty hunter. 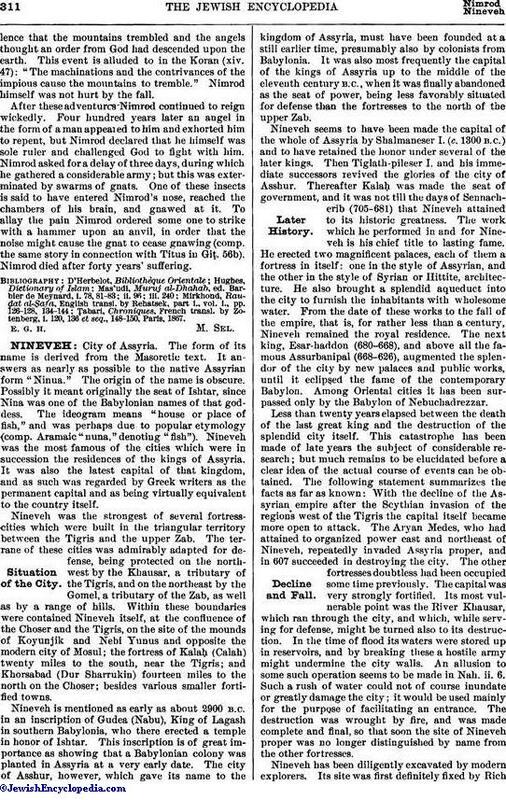 His "kingdom" comprised Babel, Erech, Accad, and Calneh, in the land of Sinar, otherwise known as the land of Nimrod (Gen. x. 8-10; I Chron. i. 10; Micah v. 5 [A. V. 6]). Nimrod is the prototype of a rebellious people, his name being interpreted as "he who made all the people rebellious against God" (Pes. 94b; comp. Targ. of pseudo-Jonathan and Targ. Yer. to Gen. x. 9). He is identified with Cush and with Amraphel, the name of the latter being interpreted as "he whose words are dark" ( ; Gen. R. xlii. 5; for other explanations see below). As he was the first hunter he was consequently the first who introduced the eating of meat by man. He was also the first to make war on other peoples (Midr. Agadah to Gen. x. 9). Nimrod was not wicked in his outh. On the contrary, when a young man he used to sacrifice to Yhwh the animals which he caught while hunting ("Sefer ha-Yashar," section "Noaḥ," pp. 9a et seq., Leghorn, 1870). His great success in hunting (comp. Gen. x. 9) was due to the fact that he wore the coats of skin which God made for Adam and Eve (Gen. iii. 21). These coats were handed down from father to son, and thus came into the possession of Noah, who took them with him into the ark, whence they were stolen by Ham. The latter gave them to his son Cush, who in turn gave them to Nimrod, and when the animals saw the latter clad in them, they crouched before him so that he had no difficulty in catching them. The people, however, thought that these feats were due to his extraordinary strength, so that they made him their king (Pirḳe R. El. xxiv. ; "Sefer ha-Yashar," l.c. ; comp. Gen. R. lxv. 12). According to another account, when Nimrod was eighteen years old, war broke out between the Hamites, his kinsmen, and the Japhethites. The latter were at first victorious, but Nimrod, at the head of a small army of Cushites, attacked and defeated them, after which he was made king over all the people on earth, appointing Terah his minister. It was then, elated by so much glory, that Nimrod changed his behavior toward Yhwh and became the most flagrant idolater. When informed of Abraham's birth he requested Terah to sell him the new-born child in order that he might kill it (see Jew. Encyc. i. 86a, s.v. Abraham in Rabbinical Literature). Terah hid Abraham and in his stead brought to Nimrod the child of a slave, which Nimrod dashed to pieces ("Sefer ha-Yashar," l.c.). Nimrod is generally considered to have been the one who suggested building the Tower of Babel and who directed its construction. God said: "I made Nimrod great; but he built a tower in order that he might rebel against Me" (Ḥul. 89b). The tower is called by the Rabbis "the house of Nimrod," and is considered as a house of idolatry which the owners abandoned in time of peace; consequently Jews may make use of it ('Ab. Zarah 53b). After the builders of the tower were dispersed Nimrod remained in Shinar, where he reestablished his kingdom. According to the "Sefer ha-Yashar" (l.c. ), he at this time acquired the name "Amraphel" in allusion to the fall of his princes ( ) during the dispersion. According to the Targum of pseudo-Jonathan (to Gen. x. 11), however, Nimrod had left Babylonia before the building of the tower, and had gone to Assyria, where he built four other cities, namely, Nineveh, Rehobot, Calah, and Resen (comp. Naḥmanides ad loc.). The punishment visited on the builders of the tower did not cause Nimrod to change his conduct; he remained an idolater. He particularly persecuted Abraham, who by his command was thrown into a heated furnace; and it was on this account, according to one opinion, that Nimrod was called "Amraphel" ( = "he said, throw in"; Targ. pseudo-Jonathan to Gen. xiv. 1; Gen. R. xlii. 5; Cant. R. viii. 8). When Nimrod was informed that Abraham had come forth from the furnace uninjured, he remitted his persecution of the worshiper of Yhwh; but on the following night he saw in a dream a man coming out of the furnace and advancing toward him with a drawn sword. Nimrod thereupon ran away, but the man threw an egg at him; this was afterward transformed into a large river in which all his troops were drowned, only he himself and three of his followers escaping. Then the river again became an egg, and from the latter came forth a small fowl, which flew at Nimrod and pecked out his eye. The dream was interpreted as forecasting Nimrod's defeat by Abraham, wherefore Nimrod sent secretly to kill Abraham; but the latter emigrated with his family to the land of Canaan. Ten years later Nimrod came to wage war with Chedorlaomer, King of Elam, who had been one of Nimrod's generals, and who after the dispersion of the builders of the tower went to Elam and formed there an independent kingdom. Nimrod at the head of an army set out with the intention of punishing his rebellious general, but the latter routed him. Nimrod then became a vassal of Chedorlaomer, who involved him in the war with the kings of Sodom and Gomorrah, with whom he was defeated by Abraham ("Sefer ha-Yashar," l.c. ; comp. Gen. xiv. 1-17). Nimrod was slain by Esau, between whom and himself jealousy existed owing to the fact that they were both hunters (Targ. pseudo-Jonathan to Gen. xxv. 27; "Sefer ha-Yashar," section "Toledot," p. 40b; Pirḳe R. El. l.c. ; comp. Gen. R. lxv. 12). Two prominent theories are now held in regard to Nimrod's identity: one, adopted by G. Smith and Jeremias, is that Nimrod is to be identified with the Babylonian hero Izdubar or Gishdubar (Gilgamesh); the second, that of Sayce,Pinches, and others, identifies Nimrod with Marduk, the Babylonian Mercury. The former identification is based on the fact that Izdubar is represented in the Babylonian epos as a mighty hunter, always accompanied by four dogs, and as the founder of the first great kingdom in Asia. Moreover, instead of "Izdubar"—the correct reading of which had not yet been determined—Jeremias saw the possibility of reading "Namra Udu" (shining light), a reading which would have made the identification with Nimrod almost certain. Those who identify Nimrod with Marduk, however, object that the name of Izdubar must be read, as is now generally conceded, "Gilgamesh," and that the signs which constitute the name of Marduk, who also is represented as a hunter, are read phonetically "Amar Ud"; and ideographically they may be read "Namr Ud"—in Hebrew "Nimrod." The difficulty of reconciling the Biblical Nimrod, the son of Cush, with Marduk, the son of Ea, may be overcome by interpreting the Biblical words as meaning that Nimrod was a descendant of Cush. Two other theories may be mentioned: one is that Nimrod represents the constellation of Orion; the other is that Nimrod stands for a tribe, not an individual (comp. Lagarde, "Armenische Studien," in "Abhandlungen der Göttinger Gesellschaft der Wissenschaften," xxii. 77; Nöldeke, in "Z. D. M. G." xxviii. 279). Rubin, Birusi ha-Kasdi, pp. 71-72, Vienna, 1882. By the Arabs Nimrod is considered as the supreme example of the tyrant ("al-jabbar"). 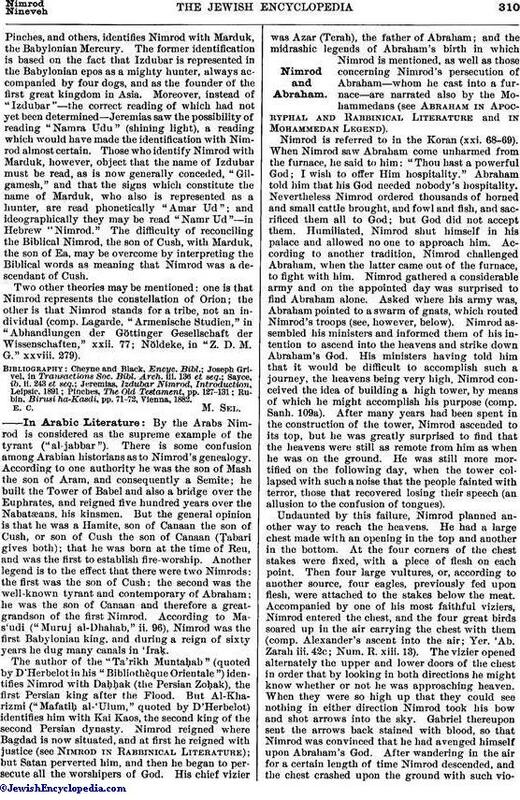 There is some confusion among Arabian historians as to Nimrod's genealogy. According to one authority he was the son of Mash the son of Aram, and consequently a Semite; he built the Tower of Babel and also a bridge over the Euphrates, and reigned five hundred years over the Nabatæans, his kinsmen. But the general opinion is that he was a Hamite, son of Canaan the son of Cush, or son of Cush the son of Canaan (Ṭabari gives both); that he was born at the time of Reu, and was the first to establish fire-worship. Another legend is to the effect that there were two Nimrods: the first was the son of Cush; the second was the well-known tyrant and contemporary of Abraham; he was the son of Canaan and therefore a great-grandson of the first Nimrod. According to Mas'udi ("Muruj al-Dhahab," ii. 96), Nimrod was the first Babylonian king, and during a reign of sixty years he dug many canals in 'Iraḳ. The author of the "Ta'rikh Muntaḥab" (quoted by D'Herbelot in his "Bibliothèque Orientale") identifies Nimrod with Daḥḥak (the Persian Zoḥak), the first Persian king after the Flood. But Al-Kharizmi ("Mafatiḥ al-'Ulum," quoted by D'Herbelot) identifies him with Kai Kaos, the second king of the second Persian dynasty. Nimrod reigned where Bagdad is now situated, and at first he reigned with justice (see Nimrod in Rabbinical Literature); but Satan perverted him, and then he began to persecute all the worshipers of God. 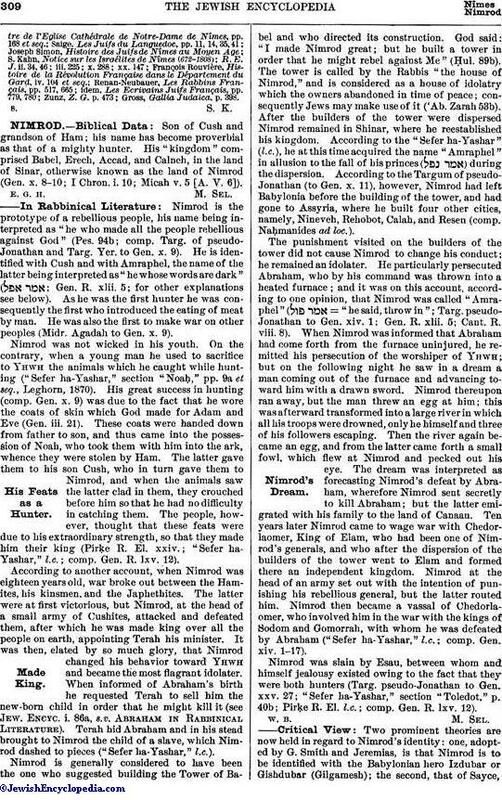 His chief vizier was Azar (Terah), the father of Abraham; and the midrashic legends of Abraham's birth in which Nimrod is mentioned, as well as those concerning Nimrod's persecution of Abraham—whom he cast into a furnace—are narrated also by the Mohammedans (see Abraham in Apocryphal and Rabbinical Literature and in Mohammedan Legend). Nimrod is referred to in the Koran (xxi. 68-69). When Nimrod saw Abraham come unharmed from the furnace, he said to him: "Thou hast a powerful God; I wish to offer Him hospitality." Abraham told him that his God needed nobody's hospitality. Nevertheless Nimrod ordered thousands of horned and small cattle brought, and fowl and fish, and sacrificed them all to God; but God did not accept them. Humiliated, Nimrod shut himself in his palace and allowed no one to approach him. According to another tradition, Nimrod challenged Abraham, when the latter came out of the furnace, to fight with him. Nimrod gathered a considerable army and on the appointed day was surprised to find Abraham alone. Asked where his army was, Abraham pointed to a swarm of gnats, which routed Nimrod's troops (see, however, below). Nimrod assembled his ministers and informed them of his intention to ascend into the heavens and strike down Abraham's God. His ministers having told him that it would be difficult to accomplish such a journey, the heavens being very high, Nimrod conceived the idea of building a high tower, by means of which he might accomplish his purpose (comp. Sanh. 109a). After many years had been spent in the construction of the tower, Nimrod ascended to its top, but he was greatly surprised to find that the heavens were still as remote from him as when he was on the ground. He was still more mortified on the following day, when the tower collapsed with such a noise that the people fainted with terror, those that recovered losing their speech (an allusion to the confusion of tongues). Undaunted by this failure, Nimrod planned another way to reach the heavens. He had a large chest made with an opening in the top and another in the bottom. At the four corners of the chest stakes were fixed, with a piece of flesh on each point. Then four large vultures, or, according to another source, four eagles, previously fed upon flesh, were attached to the stakes below the meat. Accompanied by one of his most faithful viziers, Nimrod entered the chest, and the four great birds soared up in the air carrying the chest with them (comp. Alexander's ascent into the air; Yer. 'Ab. Zarah iii. 42c; Num. R. xiii. 13). The vizier opened alternately the upper and lower doors of the chest in order that by looking in both directions he might know whether or not he was approaching heaven. When they were so high up that they could see nothing in either direction Nimrod took his bow and shot arrows into the sky. Gabriel thereupon sent the arrows back stained with blood, so that Nimrod was convinced that he had avenged himself upon Abraham's God. After wandering in the air for a certain length of time Nimrod descended, and the chest crashed upon the ground with such violencethat the mountains trembled and the angels thought an order from God had descended upon the earth. This event is alluded to in the Koran (xiv. 47): "The machinations and the contrivances of the impious cause the mountains to tremble." Nimrod himself was not hurt by the fall. After these adventures Nimrod continued to reign wickedly. Four hundred years later an angel in the form of a man appeared to him and exhorted him to repent, but Nimrod declared that he himself was sole ruler and challenged God to fight with him. Nimrod asked for a delay of three days, during which he gathered a considerable army; but this was exterminated by swarms of gnats. One of these insects is said to have entered Nimrod's nose, reached the chambers of his brain, and gnawed at it. To allay the pain Nimrod ordered some one to strike with a hammer upon an anvil, in order that the noise might cause the gnat to cease gnawing (comp. the same story in connection with Titus in Giṭ. 56b). Nimrod died after forty years' suffering. Ṭabari, Chroniques, French transl. by Zotenberg, i. 120, 136 et seq., 148-150, Paris, 1867.